Fun cookie fact: baking a cake led to how to make drop cookies! Cookies, or “little cakes,” came to be when small amounts of batter were dropped onto baking pans to test oven temperature before baking a cake. That means the first cookies were drop cookies. You may think that drop cookies take too much time to make or are too complicated to make in your own kitchen. These baking tips can help change that for you. Or maybe you’re a veteran cookie baker that simply wants some baking hints for how to make drop cookies and save time and save mess in the process. Either way, read on. A cookie scoop or a measuring cup give drop cookies a more uniform size than scooping them with a spoon. If you’re making jumbo drop cookies, use a ¼ cup measure to scoop evenly-shaped cookies from cookie dough. If scooping with spoons, use two kitchen spoons. Scoop dough with one spoon and push it onto the cookie sheet with the other spoon. 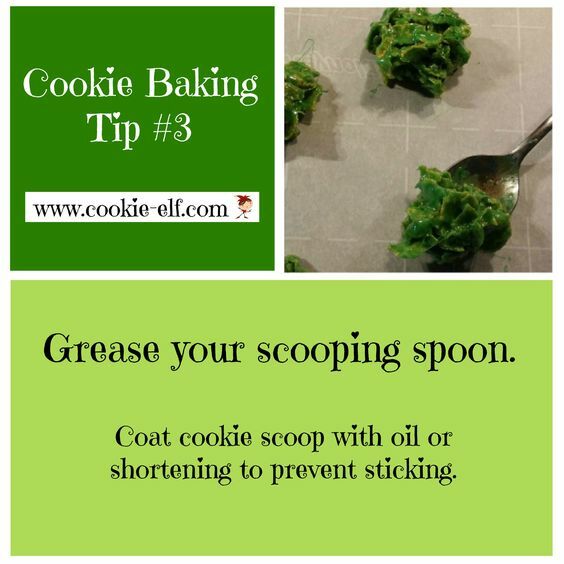 Coat your cookie scoop, spoon, or measuring cup with vegetable oil or shortening to prevent cookie dough from sticking as you drop it. Form evenly –sized drop cookies by leveling off cookie dough in the cookie scoop or measuring cup before leasing the dough onto the baking pan. Drop cookie dough varies in texture from quite soft to stiff. When cookie dough is thick, drop rounds as usual but then flatten them to allow cookies to bake as discs rather than as mounds. A lower baking temperature (325F rather than the typical 350F) allows thick drop cookies to bake evenly. Some drop cookie recipes call for ungreased baking sheets. These recipes contain plenty of fat in the dough, which prevents the cookies from sticking to the pan. Most drop cookie recipes call for range of baking times. Baking time varies to cookie size. Give larger scoops of cookie dough a minute or two longer to bake than smaller cookies. Drop cookies are “done” when peaks on the cookie surfaces begin to brown. 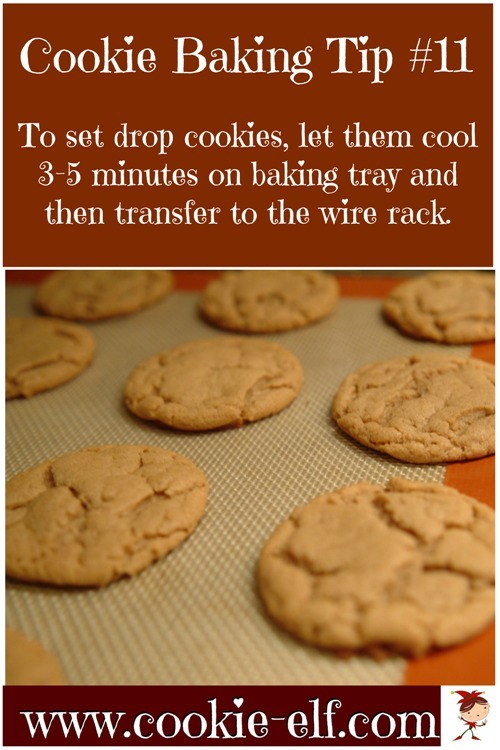 To get drop cookies to set, let them cool 3-5 minutes on the baking tray before transferring them to a wire rack. Drop cookies with add-ins will look even better when you press extra add-ins (like chocolate chips, raisins, or marshmallows) onto tops of cookie before baking. Scoop drop cookie dough containing mini marshmallows so that marshmallows are in the middle of the cookie, not touching the baking pan. This way marshmallows won’t ooze onto the pan while baking. Get more baking hints on our Baking Tips Pinterest board.